As we’ve gotten to know our visitors over the past year, one thing’s become clear—they certainly know how to wield a camera! Turns out, Frost Science is full of Instagram-worthy photo opps and moments, some of which we’ve shared on our @frostscience Instagram page. Visitors seem to get a kick out of the visually arresting projection wall in our Feathers to the Stars exhibition. The horizontal white stripes illuminated against a black background give an artsy air to the typical photo backdrop. Ethereally floating in their salt water habitats, guests can’t seem to get enough of our jellies. Their iridescent glow under black lights make for an IG-worthy pic. You’ll find them in the Deep level of our Aquarium. With jaw-dropping views of Biscayne Bay and the Miami skyline, it’s no surprise that our rooftop terraces are a favorite backdrop for smartphone snaps. Our interactive dance floor seems to have all the right moves when it comes to our visitors. With every step, hop and twirl comes a dazzling display of lights and shapes that kids of all ages can’t seem to get enough of. Hands-down, our iconic Oculus wins the prize for most popular spot to snap an Instagram pic on our entire campus. 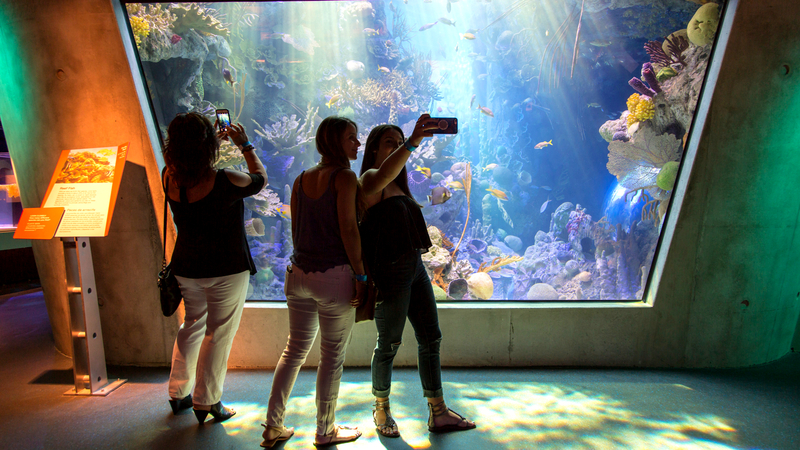 The 31-foot wide lens provides a spellbinding view into the conical Gulf Stream aquarium above. Some of our visitors have even been photobombed by one of our resident silky sharks! What’s your favorite place to take a photo in Frost Science? Tag us on your next post at @frostscience, #frostscience or #itssciencemiami and let us know!